Carpal tunnel syndrome is a common problem that affects the use of your hand, and is caused by compression of the median nerve at the wrist. It most often occurs when the median nerve in the wrist becomes inflamed after being aggravated by repetitive movements such as typing on a computer keyboard or playing the piano. It also seems to affect professional artists fairly commonly – in particular, sculptors and printmakers. 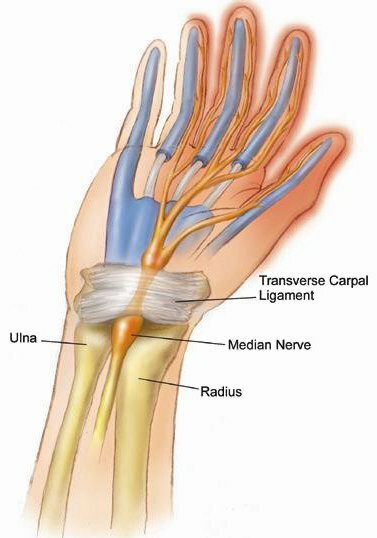 The “carpal tunnel” is formed by the bones, tendons and ligaments that surround the median nerve. Since the median nerve supplies sensation to the thumb, index and middle finger, and part of the ring finger, and provides motion to the muscles of the thumb and hand, you might notice numbness and weakness in these areas. Thesesymptoms are often exaggerated when the wrist is bent forward. This numbness or pain may be worse at night, and may actually keep you awake. During the day, it may occur more often when you are participating in activities that involve bending of your wrist. Diseases or conditions that may increase your chances of developing carpal tunnel syndrome include pregnancy, diabetes, menopause, broken or dislocated bones in the wrist, and obesity. Additional causes include repetitive and forceful grasping with the hands, bending of the wrist, and arthritis. Any repetitive motions that cause significant swelling, thickening or irritation of membranes around the tendons in the carpal tunnel can result in pressure on the median nerve, disrupting transmission of sensations from the hand up to the arm and to the central nervous system. It is important to seek medical assistance when you first notice persistent symptoms. Do not wait for the pain to become intolerable. Before your doctor can recommend a course of treatment, he or she will perform a thorough evaluation of your condition, including a medical history, physical examination and diagnostic tests. Your doctor will document your symptoms and ask about the extent to which these symptoms affect your daily living. The physical examination will include an assessment of sensation, strength and reflexes in your hand. X-ray: An x-ray will show the bones of the wrist and determine if any abnormalities may be contributing to carpal tunnel syndrome or another disorder. Electromyogram and Nerve Conduction Studies (EMG/NCS): These tests primarily study how the nerves and muscles are working together. They measure the electrical impulse along nerve roots, peripheral nerves and muscle tissue. The main purpose of conservative treatment is to reduce or eliminate repetitive injury to the median nerve. In some cases, carpal tunnel syndrome can be treated by immobilizing the wrist in a splint to minimize or stop pressure on the nerves. If that does not work, patients are sometimes prescribed anti-inflammatory medications or cortisone injections in the wrist to reduce swelling. Your doctor may suggest specific types of hand and wrist exercises, which may be helpful. Treatment for carpal tunnel syndrome may include rest, the use of a wrist splint during sleep, or physical therapy. Conservative treatment methods may continue for up to eight weeks. 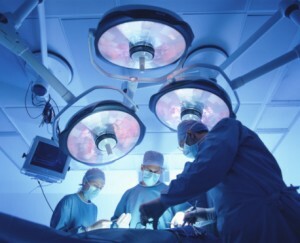 Only a small percentage of patients require surgery. Factors leading to surgery include the presence of persistent neurological symptoms and lack of response to conservative treatment. If you experience severe pain that cannot be relieved through rest, rehabilitation or nonsurgical treatment, you may be a candidate for one of several surgical procedures that can be performed to relieve pressure on the median nerve. The most common procedure is called carpal tunnel release, which can be performed using an open incision or endoscopic techniques. The open incision procedure or carpal tunnel release, involves the doctor opening your wrist and cutting the ligament at the bottom of the wrist to relieve pressure. The endoscopic carpal tunnel release procedure involves making a smaller incision and using a miniaturized camera to assist the neurosurgeon in viewing the carpal tunnel. The possibility of nerve injury is slightly higher with endoscopic surgery, but the patient’s recovery and return to work is quicker. After surgery, a dressing will be applied to your hand. You should leave this secured in place until your first office visit following surgery. You may need bandages on one or both wrists depending on your surgery. If this is the case, you may require extra assistance at home with everyday activities. Your stitches can be removed about 10-14 days after surgery. Make sure you avoid repetitive use of the hand for four weeks after surgery and avoid getting the stitches wet. You will notice that the pain and numbness begins to improve after surgery, but you may have tenderness in the area of the incision for several months. Recurrence of symptoms after surgery for carpal tunnel syndrome is rare, occurring in less than 5 percent of patients. A majority of patients recover completely. To avoid injuring yourself again, it may help to change the way you perform repetitive movements, the frequency with which you perform the movements, and the amount of time you rest between periods when you must perform these movements.